Over the course of five years of study I have read a lot of books. Some I remember, some I don't, but very few books have forced me to make a paradigmatic shift in my thinking. The writings of Dutch Calvinist, Cornelius Van Til, however, manage that trick amply. 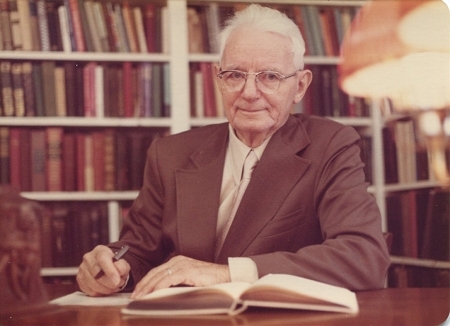 Van Til was professor of Apologetics at Westminster Theological Seminary and revolutionized his field. Van Til's idea is remarkably simple, but commonly misunderstood. Van Til's suggestion was that human experience, rationality, intelligibility and meaning is only possible if Christian Theism is true. In other words, the truth of Christian Theism is the necessary condition for the possibility of human experience. James Anderson, who teaches at Reformed Theological Seminary and looks after www.vantil.info, calls this argument the "the mother of all epistemological arguments." And that is why I found it so gripping. I was also taught about Van Til by someone with his own unique (and thoroughly pastoral) method for gripping his class with an idea - Dr Kevin Zuber at Moody Bible Institute. Having been involved in evangelistic ministry for all my Christian life, Apologetics was a necessary task - the answering of tough questions. However, I had always found resources on the matter to be lacking. My own method was a cobbled together argument made up of tid-bits of Ravi Zacharius style cultural critique and youth ministry friendly versions of Aquinas' five ways. More often than not my apologetic method involved leaving the particular question in hand as soon as I possibly could and stating the gospel and its relevance to the issue. My somewhat more shallow reason for struggling was my poor memory for concrete facts. Who can remember all the evidences for the veracity of the Resurrection? Antithesis means that a person's unbelief renders an opposition to the Christian worldview at every point. An unbeliever cannot, even if he tries, be partial to Biblical Christianity. In principle, his worldview does not overlap at any point with the Christian worldview. Common Grace is the idea that the unbeliever's antithetical position towards the Christian worldview is impossible in practice. First, because he or she remains an inhabitant of God's world and a creature of God and, second, because of the work of God in giving them a livable life in his world. Unbelievers are, therefore, inconsistent with their worldview. An atheist, for example, cannot live, in practice, what he pertains to hold in principle. Common ground, therefore, is not generated by overlapping worldviews, but by being part of God's world and by the inability to operate rationally without borrowing from the Christian worldview. Incidently this kind of common ground works both ways - the Christian, because of sin, will be inconsistent with his or her Christian worldview, but that also makes it possible to relate to other sinners in their unbelief. Van Til suggested that in order to generate an awareness of this inconsistency in the unbeliever, a self-consciousness of why he cannot accept theistic arguments even when they are valid and sound, the unbeliever must see the world from two perspectives. First, he must be shown the consequences of his own worldview if he is not allowed to borrow from the Christian worldview. For example, an atheist materialist can do very little in the way of supplying an ethical system consisting of absolutes that is wholly consistent with his chance-ruled materialism. Second, the unbeliever must be shown that human experience can be rendered rational, meaningful and intelligible solely on the basis of the Christian worldview. One of the most interesting points Van Til makes is that all human beings are in some kind of covenant relationship with God, either as "covenant keepers" or "covenant breakers," believers or unbelievers. But that all human beings know this. This latter point came as somewhat of surprise to me. I had presumed that belief meant knowledge of God and unbelief meant no knowledge of God. But that is not how Van Til saw things. He took Paul, in Romans 1, to be saying that all human beings know God. The reason for their unbelief is not a lack of knowledge of God (an innocent ignorance), but a willful denial of him. One who rejects the gospel, therefore, knows its truth, but is hostile to God due to being a covenant breaker. In denying God, unbelievers create fantastic systems, worldviews and theories that avoid God; they attempt to hide from his reality even while knowing him and their sinfulness before him. Unbelief, therefore, is not solely a lack of knowledge, but a moral problem; it is sin. And it is sin that no fallen human being can do anything about. Sin that deserves death, an eternal separation from God. But it is the same sin that God is capable of saving us from. The good news is that Jesus died not only for our sins, what we normally consider our moral failings, but for our hostility towards him - our unbelief. In fact, the sin of unbelief is the fundamental sin that yields all other sin. It was, after all, the failure of the first humans to trust God's words to them that got us into all this mess in the first place. The work of Van Til is much maligned in evangelical circles. Perhaps it has been stated badly. Many regard Van Til's work as obscure. He studied philosophy in the short lived era of British idealism (to demonstrate the brief nature of this era you should try to think of a British idealist!). Although not an idealist himself, the language he used often relied on this particular mode of speech and grand-scheme type arguments. The influence of Van Til is felt in this blog. It is the idea I used to generate the purpose of the blog - to make sense of everything one must presuppose the truth of Christian Theism, the truth of the Bible. It is a biting argument for Christianity and not an easy one to make. It is somewhat of an all-or-nothing view. But, that, for me, is its attraction. My salvation is all God and so, hopefully, is my apologetic. I see you refer to Kevin D. Zuber of Moody as a Presuppositionalists of sorts! Do you have Kevin D. Zuber's email? I would like to interview him for our series on Dispensational Presuppositionalists. If you do can you private message me on our facebook page? Thanks!